I am not a big fan of seafood, even though I know fish is full of Omega-3 fat, which is healthy for your heart. So, if I want to have fish for a meal, it most likely will be at a restaurant, but even then it is a real commitment on my part. I don’t mind the taste of fish as much as the odor left behind in the house after cooking time, or from the fish, before, or even after it is cooked. Every fisherman tells me that fresh fish does not have much of an odor. This means that your freshest fish comes from a real fish store, rather your your favorite supermarket. Also, when purchasing your fish, try to stay away from farm raised fish, as these have lots of fat that is bad for you. So, why am I posting a fish recipe? Well, because this is one of the fish dishes that I do not mind preparing, and actually enjoy eating. It is very quick, simple, and delicious. It can be broiled or grilled. I normally broil it, out of convenience. Wipe clean the fish fillets. Mix the chopped garlic, pepper, and Soy Sauce. Pour the marinade mixture over the fillets. 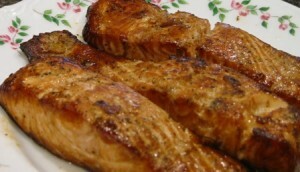 Cover, place it in the refrigerator for at least an hour, turning the fish once, halfway through the marinating process. Cover a broiling pan with foil (for easier cleaning), and place the fillets with skin up. Pour half of the marinate over the fish. Pour the rest of the marinate over the fish. Broil another 6 minutes, on low. Serve with steamed wild rice, and veggies. I noticed that Salmon is so much tastier, when I remove the grayish meat that is right under the skin, and discord it together with the skin, after baking, but before eating it. You can sprinkle some lemon juice over the fillets, but I prefer to have mine plain. This is a great recipe and REALLY easy to make! Thank you for taking the time to leave comments. For a real treat and easy clean up, I put my salmon into a little bag I make with parchment paper. Each guest gets his or her own little heart-shaped bag filled with salmon and sauteed vegetables that have all baked in the oven. I got the idea from the Frugal Gourmet. Your idea sounds wonderful and so cute. I will have to try this next time when I bake my fish, since so far I have been broiling it.